The compass bearing is the direction towards which you are headed, as shown by a compass. The four cardinal points on a compass, which split the circumference of the compass into four equal parts, are (going clockwise) North, East, South and West. Since there are 360º in the circumference, the cardinal points are separated by 360º/4 or 90º. A compass rose is shown on the right. It shows both angles and the cardinal points. Notice that the convention for measuring angles is different to the convention we used in the unit circle definition of the trigonometric functions. Firstly 0o is North, rather than the x axis. Secondly the direction in which angles increase is clockwise rather than counter-clockwise. Click for a list of the names of 32 compass points. These points split each 90º angle into eight, hence the angle between two consecutive points is 90º/8 or 111⁄4º. Go to wikipedia and look at various designs of compass rose. Some are very ornate. 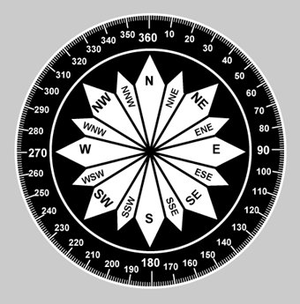 Here are some considerations for the practical design of the compass rose. Good contrast so bearings are clear in both bright and (night time) lower lighting. Choice of a sans-serif font with little variation in stroke-width for legibility. Larger font and larger arits for the cardinal points. Also slight displacement of number text for cardinal points to give further emphasis. Finest scale at perimeter of circle for maximum angular accuracy. Another notation, which can give bearings more precisely, is to write them in the form N 6º E, meaning the bearing that makes an angle of 6º with North towards East. (North or South is usually given before East or West, and the angle never exceeds 90º.) In this notation, North by East is N 111⁄4º E.
Yet another notation, rare among mariners but used by airline pilots, is to give the bearing as an angle measured clockwise from North. Thus for example East is 90º, South is 180º and South-West is 225º. The compass rose at the top of this page shows this way of measuring bearings. It is also noteworthy that bearings can also be notated beginning with the degree measure followed by the initial direction. For example, South-West can be correctly expressed as 225º N, with North being the starting point spawning a clockwise rotation, or 45º S, with South being the starting point spawning a clockwise rotation. This is ostensibly known as the referential bearing. True north is the direction from a point to the north pole of the Earth's rotation axis. It may be determined by observations of the stars, especially (in the Northern hemisphere) Polaris, α Ursae Minoris. A magnetic compass points along the Earth's magnetic field. This direction is called magnetic north. It will not in general be exactly the same as true north, because the magnetic field does not align exactly along the Earth's rotation axis. The angle between them is known as the magnetic declination. It varies between different places on the Earth; in some places close to the north and south poles it may be 180º so a compass needle points south rather than north. A more representative value nearer the equator is 5º. Even at the same point, the declination varies over time because the Earth's magnetic field varies. The map above shows how the direction of true north and magnetic north differ, and how this varies both with location and time. Over longer periods of time it is not even true that the Earth's rotational axis points towards Polaris - because of precession of the earth's axis. Nowadays, aeroplanes and most ships will have gyroscopic compasses rather than magnetic ones, so navigators need no longer worry about declination. The exercises for this page are a bit different to the majority of the exercises in this trigonometry book. They are more a wikipedia/internet 'treasure hunt' than requiring maths. Is the discovery of the precession of the Earth's axis a recent one that depends on very precise measurement or is it something that has been known for a long time? What is thought to cause the Earth's magnetic field? What is the inverse square law for gravity? Does it apply to magnetism too? How strong is the Earth's magnetic field (or a magnet equivalent to the one producing the Earth's field) - compared to an ordinary magnet that you could hold in your hand? What are gymbal rings and how do they work? What does the Earth's magnetic field 'look like' in three dimensions? Is the field vertical at the Earth's magnetic pole? Is it horizontal at the latitude and longitude where you live? Find a picture on the internet of an early compass. Do some more surfing of Wikipedia to understand how navigation, particularly of sailing ships, called for advances in astronomy, maths and science. What navigational need drove progress towards a more accurate chronometer? What is a spring tide? If you were to draw a graph of the height of water at various times of day at a port, would it look like a sine wave? When is the next spring tide? In map making, what is 'Mercartor's projection'? What are the advantages and disadvantages of different ways of representing the Earth's surface as a 2D map? This page was last edited on 8 April 2018, at 14:13.